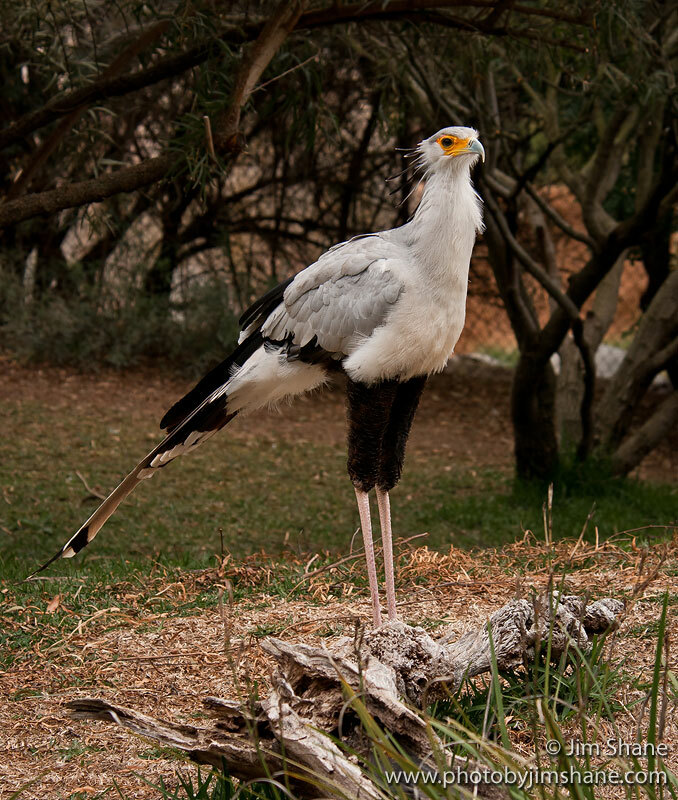 Secretarybirds have the longest legs of any bird of prey and must bend them in a crouch to feed or drink. Similar to serpent eagles like Bateleurs, their lower legs have heavy scales that may protect them while walking through the brush or when attacking their prey. Secretarybirds are related to other Accipiters, but they are the one and only member of the family Sagittariidae. 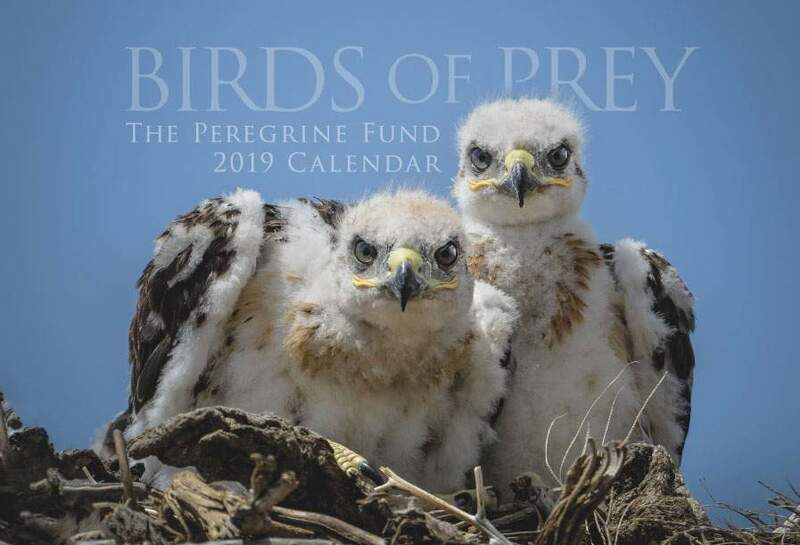 Though The Peregrine Fund doesn't work directly with Secretarybirds, our efforts in scientific research, habitat conservation, education, and community development help conserve raptors around the world. We also supply literature to researchers from our avian research library, which helps scientists around the world gather and share important information on raptor conservation. The Secretarybird is endemic to sub-Saharan Africa. It ranges from Senegal and Somalia all the way to the tip of South Africa. Similar to the Northern Harrier, this stunning, long-legged raptor is a bird of open country. Secretarybirds prefer savannas, scrub, and grasslands with scattered small thorn trees, and open patches in forests and woodlands. It is also attracted to some man-made habitats and can be seen hunting in airfields and pasture lands. As a rule, this species tends to avoid mountainous and hilly habitats, as well as extremely arid, or dry, areas. 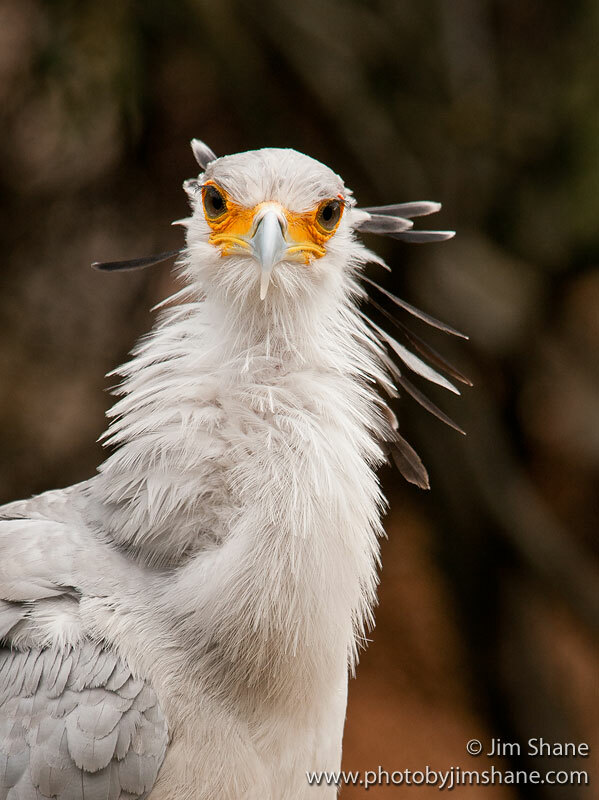 The tallest raptor in the world, the Secretarybird is unmistakeable. It has long, stork-like legs that are feathered from the thigh to the tarsus. It has a robust body covered in gray, white and black feathers, a feathered black crest and a red-orange and yellow patch of skin around its eye and in front of its strong curved beak. Though it looks more like a stork than a raptor when it flies, it is distinguishable from any other bird by the two long tail feathers that extend beyond its feet in flight. As you may imagine, a bird with such long legs is built to do a lot of walking. And the Secretarybird does not disappoint. Scientists estimate that Secretarybirds walk anywhere from 12 to 18 miles (20-30 km) a day! That would be like walking the length of an American football field 300 times or more. Sometimes, Secretarybirds do all this walking in pairs, but sometimes they walk alone, or even in small family groups. As might be exptected, larger concentrations of these birds can occur in certain areas, such as near water holes. After all, when living in an area where water is scarce, a lot of different animals gather together wherever this precious resource is available. Secretarybirds may go there to drink, but also to search out prey animals that are feeling thirsty, too. Apart from being exceptional walkers, they are also great flyers. Secretarybirds can sometimes be seen soaring on thermals high up in the sky. Secretarybirds are diurnal (daytime) raptors, though they begin hunting and foraging for food often before dawn. They usually return to their resting area, or roost, in the late afternoon. A pair of Secretarybirds may roost together in their nest all year round, or they may choose to rest on other flat-topped trees. Like many other wildlife, Secretarybird populations are declining throughout much of their range and the species has disappeared entirely in some places. Though these birds can spend time in and hunt in some human-created open spaces, habitat loss is still a huge problem for this species. Areas that are over-grazed leave little cover for prey animals, so they can be quite empty of wildlife. Other areas are being cleared for human settlements and agricultural fields – all places where a Secretarbird won't find what it needs to survive. These changes in habitat are taking their toll on this lovely bird. 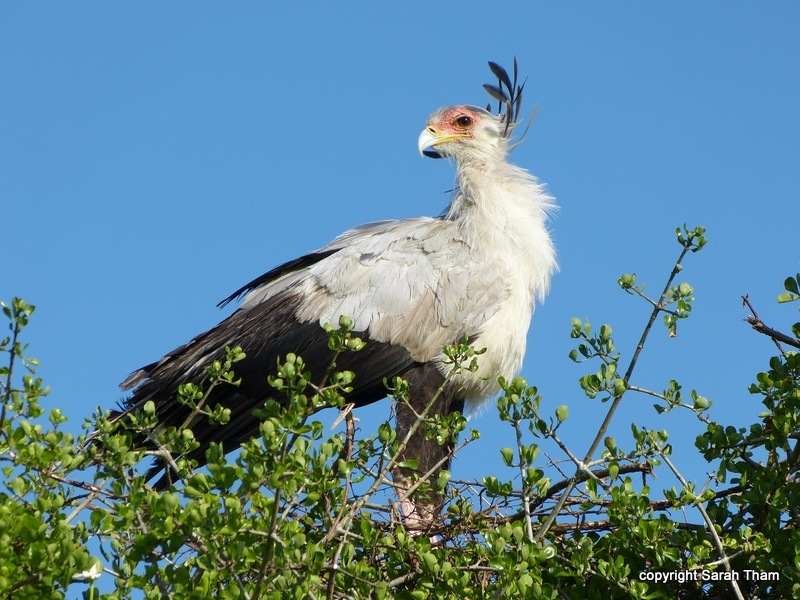 Young Secretarybirds can fall prey to other predators such as owls and ravens, but adults are rarely preyed upon. 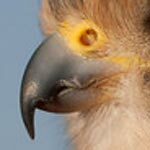 Unlike the Snail Kite, which has a very specialized diet, the Secretarybird will eat just about anything it can catch. It preys on small- to medium-sized mammals such as mice, hedgehogs and hares. It eats other birds and their eggs, too! It will catch amphibians and various invertebrates, including insects, scorpions, millipedes, and crabs. Secretarynirds also eat snakes, including several poisonous species, such as puff adders and cobras, and other reptiles, such as lizards and small tortoises. Unlike falcons, for example, which catch their prey in mid-air, Secretarybirds are almost strictly terrestrial hunters. When in search of a meal, they walk along the ground. Once they spot something they would like to eat, they stomp on it until it is dead or knock it down with a speedy kick. They are even known to stomp on the ground close to shrubs where animals may hide to flush prey out into the open where they are more easily caught. Sometimes Secretarybirds chase after their prey at high speeds, running with wings open to catch up with their meal. They will break apart dung piles with their feet or beaks to search for juicy insects. Unlike many other birds of prey, the Secretarybird often catches it prey with its bill. 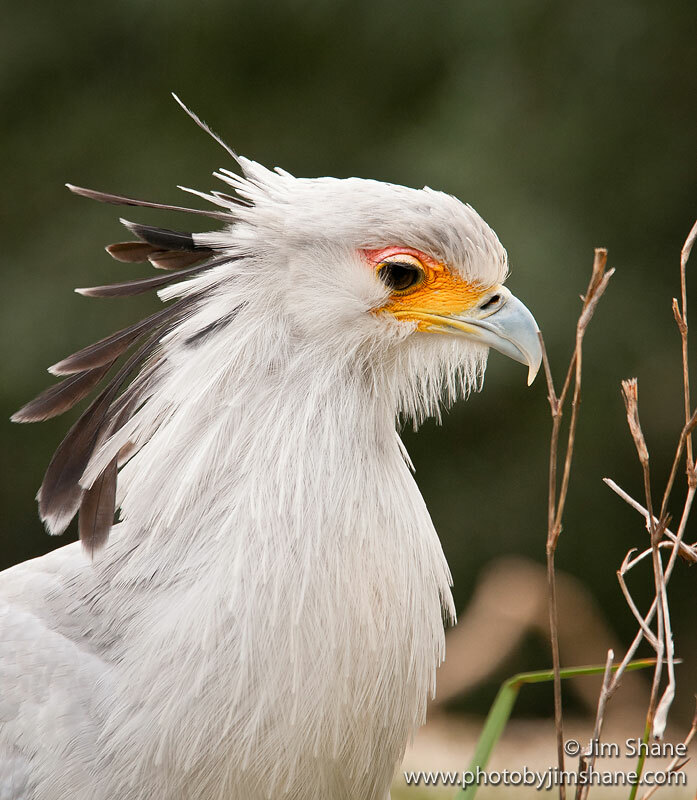 But like many owl species, Secretarybirds swallow most of their prey whole. Scientists believe that Secretarybirds are monogomous, spending their lives with one partner. A pair builds a large platform nest of sticks lined with dry grass on top of a small, flat-topped tree, such as an Acacia. They will even sometimes build their nests on top of a short bush if no trees are available. They continue to add materials to the same nest year after year. After the nest is built, the female lays 2-3 whitish eggs that must be incubated for 42-46 days. Once the eggs hatch, both the male and female help to feed their nestlings. Most other birds of prey tear food into small pieces or give whole prey to their young, but Secretarybirds regurgitate food for their chicks. This food is stored in the adults' crops until they can reach the nest and spit it back out for their young. Eventually, as the chicks get older, the parents begin bringing them whole prey to eat on their own. The young fledge at 9-15 weeks of age. Once they are out of the nest, they begin foraging for food alongside their parents. This gives them a chance to practice finding and capturing a meal on their own. Soon after fledging, the young Secretarybirds become independent, which means they are able to hunt enough food to survive without any help from their parents. The World Center for Birds of Prey offers fun ways to learn about all birds of prey. Interactive activities, tours, interesting videos, and a children's room with activities from coloring sheets to quizzes to costumes await you. The visitor center has many live raptors on display. 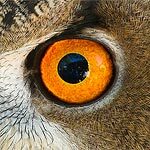 This is a great chance to see birds of prey up close and learn about the wonderful and interesting adaptations they have in order to survive in their respective habitats. There is also a touch table with feathers and other natural objects available for exploration.